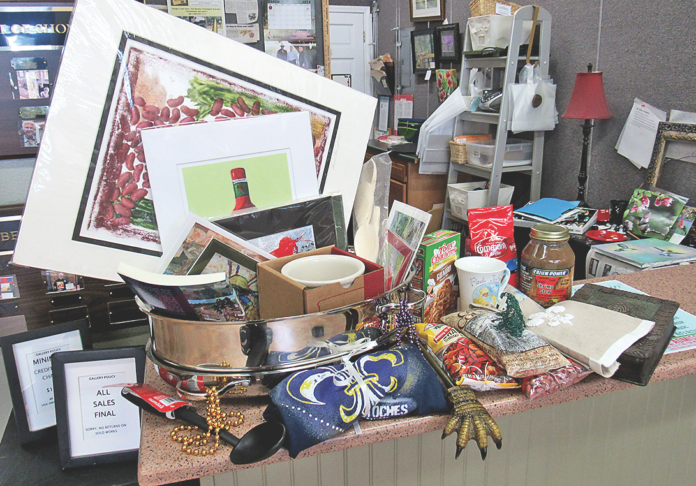 These items will be part of the gift basket the Natchitoches Art Guild and Gallery will raffle at this Saturday’s Art Along the Bricks (see information below). The winner will be drawn around 2:30 p.m. Items include art prints, cooking items, utensils and more. The Natchitoches Art Guild and Gallery will host Art Along the Bricks Saturday, March 17 in conjunction with Bloomin’ on the Bricks. Art Along the Bricks will take place from 9 a.m. to 4 p.m. along Front Street between Church Street and Rue Trudeau. Art Along the Bricks serves to provide visitors to the Natchitoches Historic District opportunities to see the latest offerings in fine arts and crafts as local and area artists display their work in an outdoor art show. Vendors and artists of fine arts and crafts (defined as hand-made) are encouraged to participate. Spaces are $50 per 10×10 space. For more information on Art Along the Bricks, contact the Natchitoches Art Guild and Gallery at (318) 352-1626.